MILWAUKEE, November 18, 2016 – Industrial company executives expect flat capital expenditure, increased cost cutting and a focus on bolt-on M&A as the path to growth in 2017, according to a survey released today by Baird, an employee-owned global financial services firm and one of the FORTUNE 100 Best Companies to Work For®. The survey, which polled industrial executives in conjunction with the 46th annual Baird Global Industrial Conference, was designed to identify what company managements believe are the key drivers and threats to profitable growth in the year ahead. Forty-three percent of executives said they are anticipating flat capital expenditure in 2017 and 80 percent anticipate cutting costs. Respondents also ranked bolt-on acquisitions as their top capital allocation priority over the next 12 months and 57 percent view Energy as the most promising end market, findings underscored by executives’ comments at Baird’s conference, held November 8-10. While survey respondents expected geopolitical developments to have less impact on business over the next two years than wage inflation and commodity prices, presenters at Baird’s conference did express that a conservative U.S. government could support a continued tailwind for infrastructure spending. From a geographic standpoint, the majority of those surveyed expect growth to be flat across the globe in 2017. The remaining respondents expect growth to accelerate in East Asia (33 percent) and North America (32 percent), and growth to decelerate in China (24 percent) and Western Europe (22 percent). 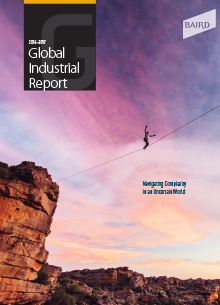 Longer term, respondents expect higher machine connectivity, commonly referred to as The Internet of Things, to have the biggest impact on the industrial market over the next three to five years, followed closely by changing demographics given aging in the developed world. 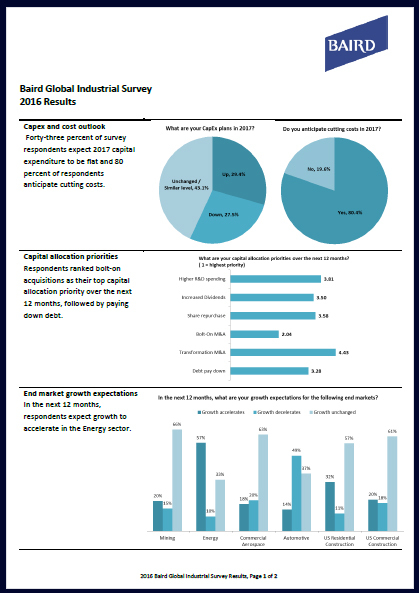 Baird conducted a survey of fifty-one industrial company executives in conjunction with the 2016 Baird Global Industrial Conference in Chicago, Illinois, November 8-10, 2016. Baird is an employee-owned, international wealth management, capital markets, private equity and asset management firm with offices in the United States, Europe and Asia. Established in 1919, Baird has more than 3,300 associates serving the needs of individual, corporate, institutional and municipal clients. Baird has more than $160 billion in client assets. Committed to being a great place to work, Baird ranked No. 6 on FORTUNE’s 100 Best Companies to Work For in 2016 – its 13th consecutive year on the list. Baird’s principal operating subsidiaries are Robert W. Baird & Co. in the United States and Robert W. Baird Group Ltd. in Europe. Baird also has an operating subsidiary in Asia supporting Baird’s investment banking and private equity operations. For more information, please visit Baird’s Web site at rwbaird.com.